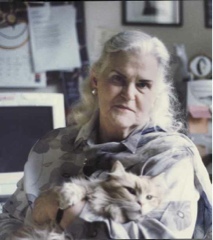 I have just read that Anne McCaffrey – one of the greatest of the SF Grand Dame’s – has passed away from a stroke, aged 85 years. An author for over 35 years, with almost a hundred titles under her belt; she wrote in a charismatic, imaginative and humorous fashion. Indeed, her first foray into SF was a biting response to the portrayal of women in the genera – she was determined to create an antithesis to the weak, decorative and passive creations that had so dominated the field up to that point. The first female author to win the Hugo Award (in 1968); she also collected the Nebula Award the following year. She also holds the honor of having created the first SF novel written by a woman to be included in the New York Times Best Seller List – for The White Dragon. The artwork (by Michael Whelan) for this book remains in print today (see below)- so great is its popularity. For a moment in time she was credited with introducing a female audience into science fiction; however for many years now her audience has been recognised as being both broad and varied. She once noted that dragons are universally popular, appealing to all ages, genders & races equally! In 2005, she became the 22nd Grand Master of Science Fiction for the Science Fiction Writers of America, while the following year she was inducted into the Science Fiction Hall of Fame. 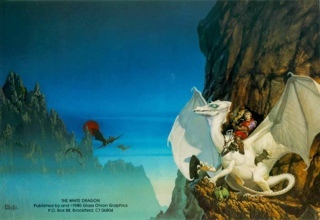 While she will always be primarily remembered for her magnificent Pern series (it has dragons people, what’s not to love!!! ); I was always more taken with her Pegasus Series and her books about The Ship Who Sang (the Brain and Brawn Series). From the age of 11 onwards, I would disappear into her worlds for hours at a time; always delighted & enthralled by her books. My condolences to her surviving family members – two sons, a daughter and (I believe) a grand-daughter – and her collaborators and friends. Her creative spirit has brought much joy and wonder to many people worldwide. ‹ PreviousWHY ARE YOU NOT WRITING AWARD WINNING DRAMA, EH?